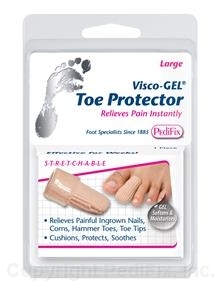 Relieves corns, ingrown nails, blisters and other toe irritations. Soft fabric-covered cap surrounds, protects and soothes with our exclusive Gel to absorb pressure and friction, while releasing mineral oil to soften and moisturize skin. 1 per pack.